Revolutionize your talent acquisition strategy by finding the best candidates from your existing talent pool. What if you could increase recruitment ROI by quickly and conveniently finding the best candidates in your existing talent pool? Only Monster can offer the targeting capabilities of semantic search cloud technology to identify qualified candidates instantly. Increase productivity by serving a copy of all your resumes, no matter where they derive from, in a secure cloud environment. Monster’s patented, award-winning 6Sense® semantic search technology intuitively understands the context of search terms – so you can search, compare, rank and manage talent in a lot less time. Find candidates in seconds from your existing talent database. more than job postings for us. It's their technology and support that really make them a true partner. 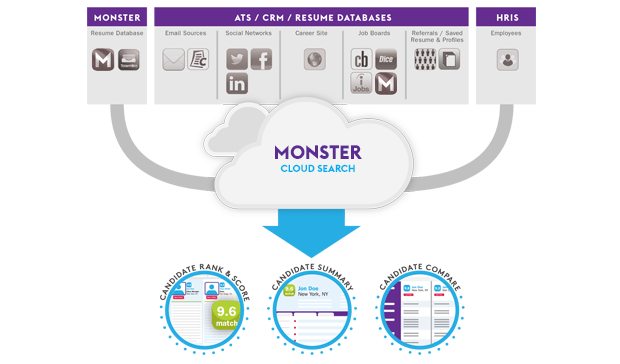 Monster Cloud Search made the recruitment process more efficient.